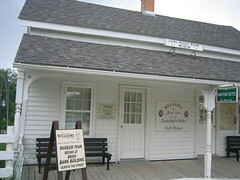 The Laura Ingalls Wilder site in Burr Oak, Iowa is within spitting distance from Minnesota. On our only rainy driving day, we decided that we had enough time to make the trek. I have fond memories of watching and reading Little House on the Prairie and wearing pinafores and bonnets pretending to be Mary and Laura with my little sister. There is a whole Little House on the Prairie trail through Wisconsin, Kansas, Minnesota, South Dakota, and Iowa. The Iowa site is where the Ingalls family lived for several years in friends' hotel. Laura never wrote of Burr Oak in her books because they were there for such a short time, it would have introduced too many new characters. However, the hotel still stands and houses a nice museum. We arrived in the rain after watching frog carnage on the wet roads and had to make a mad dash from the parking area to the visitor center. It was a long wait before the next tour, so we got to take plenty of time looking through the Little House on the Prairie knick-knacks and Laura Ingalls Wilder books. The hotel/house itself was quite small. . . the Ingalls family only got a small room for themselves for the short time they lived in Burr Oak. There were plenty of fun, historic items and Burr Oak is definitely a good stop for the die-hard Little House fan. However, the other Little House sites that correlate more to the books would probably make better stops for those with casual interest.